Windsor-Essex Janitorial Inc. offers superior carpet cleaning services to commercial, industrial and residential sectors. We use the finest pre-treatment sprays, sanitizers, deodorizers, stain removers and stain protectors to properly treat, condition, and protect your carpets and rugs. We also ensure the pH level of your carpet is properly balanced which improves the life of your carpet. Our state of the art Rotovac 360 vacuums extract the deepest soil particles and thoroughly clean all types of carpets, area rugs and oriental rugs. Yes we vacuum, by vacuuming we remove up to 79% of the dry soil. We pre-condition all of your carpet. We pay special attention to problem spots. We agitate the pre-sprayed areas for thorough dwell. We use the most powerful carpet cleaning units, we thoroughly rinse the carpet. Our cleaning units are capable of heating the water to 250 degrees with vacuum power strong enough leaving your carpet damp to the touch. 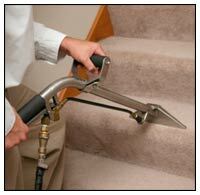 We apply the finest carpet protector available in the market today. We deodorize & sanitize your carpet. We make a final walkthrough of your home to ensure we have not missed any spots. * Note: Minimum $90.00 completed job required, except for any qualified discounts or specials. Area Rugs Priced Separately. It cleans carpet better, leaves the carpet drier. The All NEW Rotovac 360 cleans carpet, tile, and grout in an easy side to side motion. Interchangeable heads on the Rotovac 360 provides you two options for cleaning: the smooth gliding carpet cleaning head or the hard floor cleaning brush head for tile and grout. The patented vacuum heads use Rotary Jet Extraction™ which thoroughly cleans the carpet fiber from all directions to produce superior cleaning results that will amaze customers… every time! Most carpet cleaners use a manual wand. Using a manual wand requires a lot of backbreaking effort to push the wand over the carpet and it only cleans from two directions (back and forth). This often produces only mediocre cleaning results, leaving many tough stains and grime still in the carpet. Contact the professional carpet cleaners at Windsor-Essex Janitorial Inc. today and set up an appointment to thoroughly clean your carpets.